Kinder Surprise went on sale at $1.99 a couple of weeks ago and so we bought one from the Smurfs box. 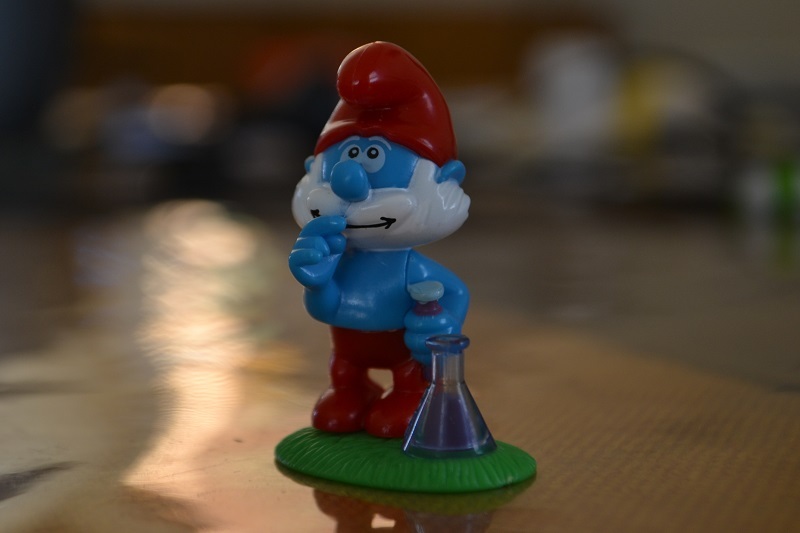 The thing about Kinder Surprise is that you cannot guarantee that you will get a Smurfs toy, but that's part of the excitement. At the regular price though, I find this treat to be too expensive so we buy only when it's on sale. We got lucky the first time and got a Papa Smurf! Very nicely detailed. Incidentally, there were also Zaini Eggs on sale which look like Kinder Surprise but instead of yellow (or orange) casing, you get a transluscent white packaging for the toy, and solid brown chocolate (you get white chocolate inner lining with Kinder Surprise). Regardless of my unfamiliarity with this brand, we also bought one and we were able to get a Mike Wazowski flat rubber figure which was nice enough. I think that, since the Zaini Eggs were promoting Monsters University on the egg covers itself, you would get a Monsters University toy every time. The Mike Wazowski 'keychain' item we got was nice, so we hoped for the toy next time. We found that the Eggs were still on sale one grocery weekend so we decided to buy 2 of each and make a video of it! Sadly, we were not able to get more Smurfs from the 2 eggs. We got 2 nice toys though, and were of sufficient size to become pets of my son's Lego minifigs. As for the 2 Zaini eggs, we got what we wished for: Monsters University figures! 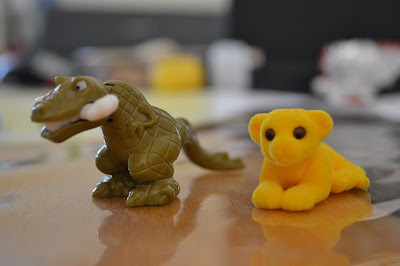 But we couldn't be more disappointed with the quality of the toys! Shoddy detailing, poorly made, small figures. Steer clear of the Zaini eggs. The toys are rip-offs, as you can see above! 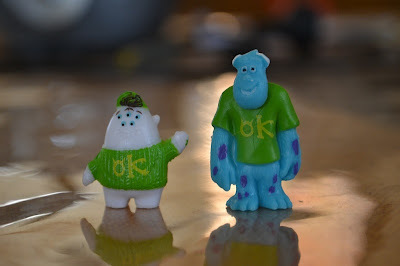 We obviously preferred the toys from Kinder Suprise, even if they weren't the Smurfs we were aiming for, because these Monsters University toys are forgettable.